Friendly and homey without lacking facilities that most hotels offer. Wonderful staff - efficient and helpful. Great position. Fluffy towels, crisp linen. Liked the decor. Breakfast delicious. Free wi-fi was a bonus. Overall, good. I would stay at the hotel again. Our Alto experience was extremely pleasant; staff were very helpful and polite. For our short stay, Alto was conveniently located to Skybus for airport transfers and Docklands for family wedding. 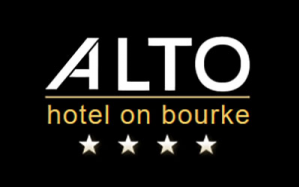 A Great short stay at the Alto, front counter staff were great and rooms fine for a short trip.Hotel is well located near Southern Cross. We will certainly be happy to stay again. We really enjoyed our stay at Alto on Bourke and felt at home. Thank you for your help and friendly service. The only down side was the noise from about 5.30am with the building going on around us but that is not the hotels fault at all. I would recommend you to our friends. Your attitude towards sustainable living has inspired us to try harder at home by reducing plastics and recycle better. Thanks for the apples at the restaurant door. I really enjoyed my stay, the Hotel offered great facilities and value. The free coffee and massage room were a nice touch. The staff were very helpful and friendly. I'd come and stay again and would recommend the Alto to others. Excellent, with a great room. Staff were courteous and the little touches made staying very enjoyable. Very happy with a four star place with ecofriendly outlook. A very enjoyable place to stay at, close to all transport and walking distance of city center . Enjoyable experience overall. A bit noisy from the trams. The staff were all really helpful, cheerful and interested. I usually prefer to stay in a more central CBD location, but if staying near Spencer Station I would definitely consider staying at the Alto. well appointed. Good value. Free wifi a plus. Always a great experience. I have stayed here with my family during a short holiday. Very warm and friendly. Staff were always helpful. We liked the small touches like the apples in the foyer and coffee/tea and newspapers available in the lounge. The location couldn't have been better - this is why we chose to stay here again. We will be back. The breakfast is good. The buffet items could be more diversified. Our experience was very pleasant. The staff were lovely and helpful and we found the little things like a coffee machine and apples really helped make our stay that much better. We had a great stay. Nice and central location with a clean and well maintained room. We found the staff friendly and professional. Will be back again. Great small hotel. Convenient location and very comfortable. Would recommend to others and decided to revisit with my wife.